To celebrate the launch of ‘Wings!’ by Paul Stewart, with collage illustrations by me (published by Otter Barry Books September 2016), I have been on a mini book tour. 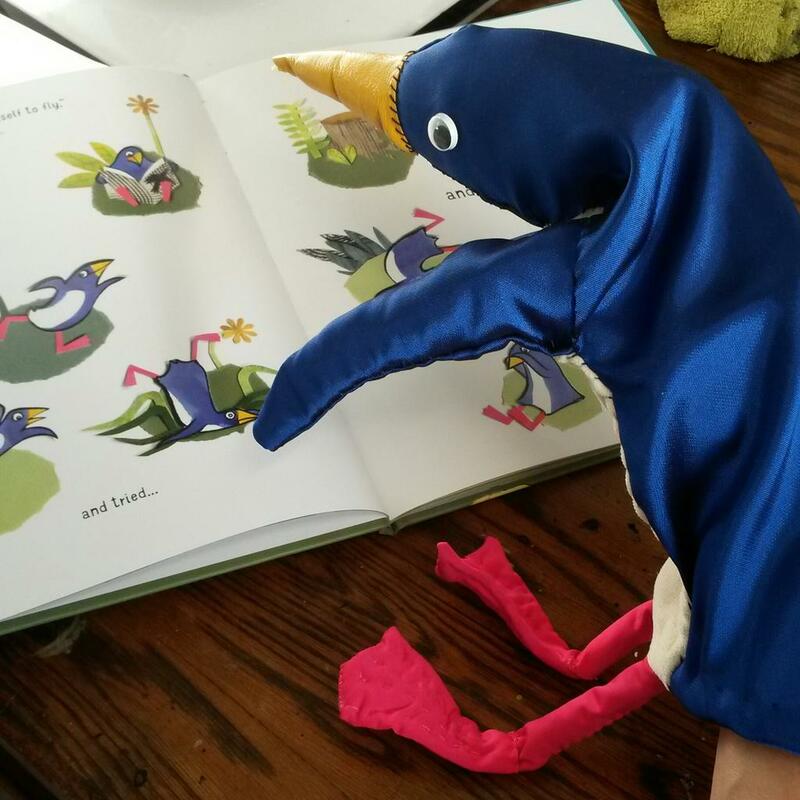 A few weeks ago I made a penguin puppet, carefully matching the colours of Penguin in the book, right down to his flamingo-pink feet. Stop one was The Book Nook in Hove – a terrific local bookshop with cafe attached. Paul settled in the big leather armchair to read the story to an eager and sharp-eyed audience (who spotted lots of details in the pictures), after which I organised a craft activity where children made their own mini-stages with a dancing penguin – just like the opening pages of the story, where Penguin is enjoying the Grand Gathering of All the Birds. Next we visited The Alligator’s Mouth bookshop in Richmond, Surrey – a lovely and well-stocked little gem. 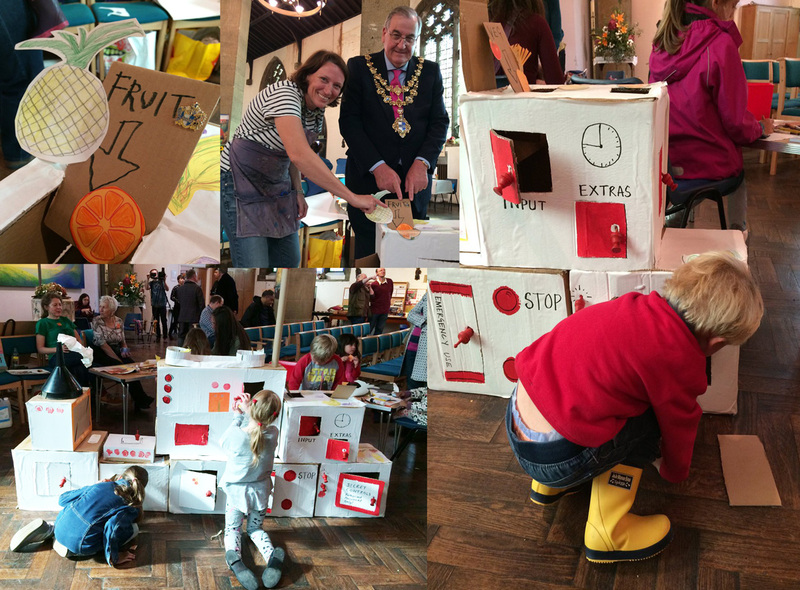 And if you missed both those events, don’t worry – we’ll be appearing again at Tales on Moon Lane in Herne Hill early next year – Monday February 13th, 10.30am. Do join us! Many thanks to all three bookshops for hosting us. This entry was posted in Books, Books, Illustration on October 4, 2016 by Jane Porter. Wings! is published on September 1 by Otter Barry Books, with words by best-selling author Paul Stewart and pictures by me. 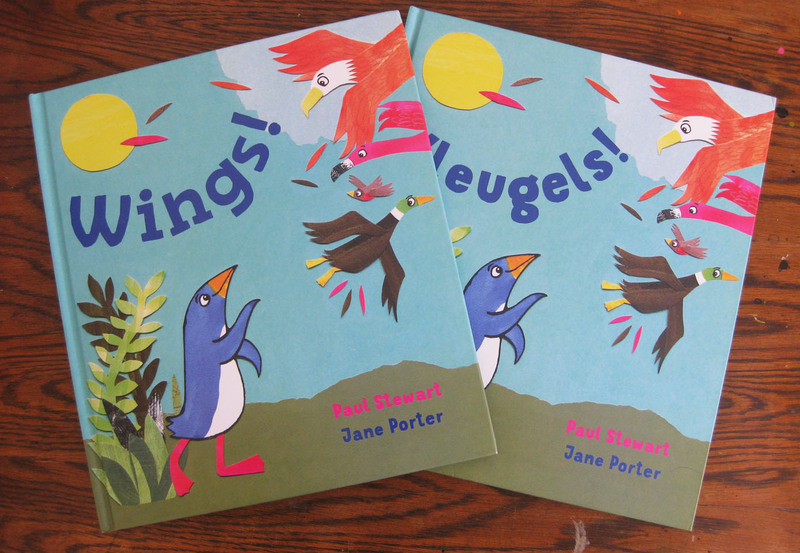 It’s the story of a penguin who wishes he could fly, tries all sorts of inventive ways to learn – and eventually, with the help of his friends, discovers his true element (published in Dutch too, by C. de Vries-Brouwers). 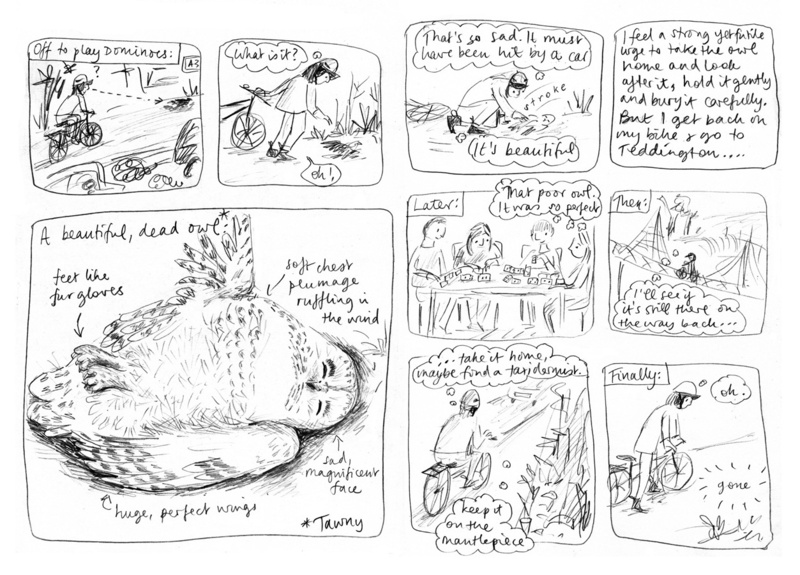 Paul Stewart’s warm and funny text was a dream to illustrate – though it was a little daunting working with someone known for collaborating with the multi-talented Chris Riddell. 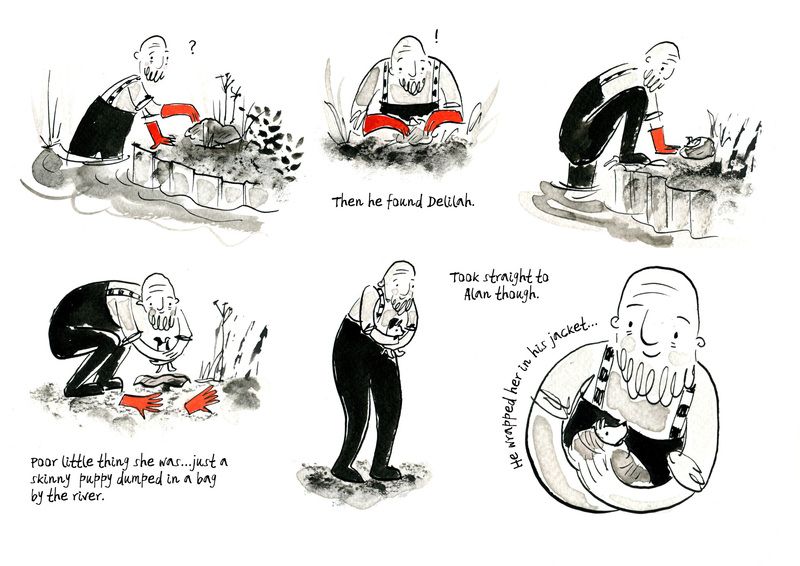 We met up just as I was starting work on the roughs, and I asked Paul what he had in mind for the Grand Gathering of All the Birds, at the start of the book. He said he was happy for me to choose. Soon after, conversation turned to music and we discovered we were both big fans of the End of the Road festival, and I had my answer – the Grand Gathering became a music festival for birds, with Swan on a Gibson semi-acoustic guitar and Eagle on penny whistle while Duck takes care of the circus skills area. All the pages are hand-made collage, and I’ve included some secret snippets of maps showing some of my favourite places, as well as some lovely mono-printed scraps leftover from a project I did last year with a school in Twickenham. 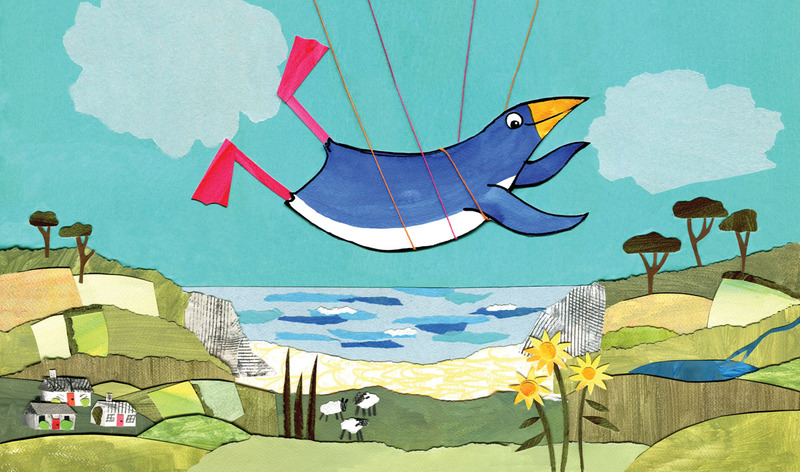 I’ve also sneakily slipped in a few favourite places – when Penguin ‘flies’ with the help of his friends and some string, the background is the golden sands of Oxwich Bay in the Gower, south Wales. And when he has his moment of despair, it’s against a backdrop of two mountains inspired (somewhat loosely) by Glydr Fawr and Glydr Fach in Snowdonia, north Wales. 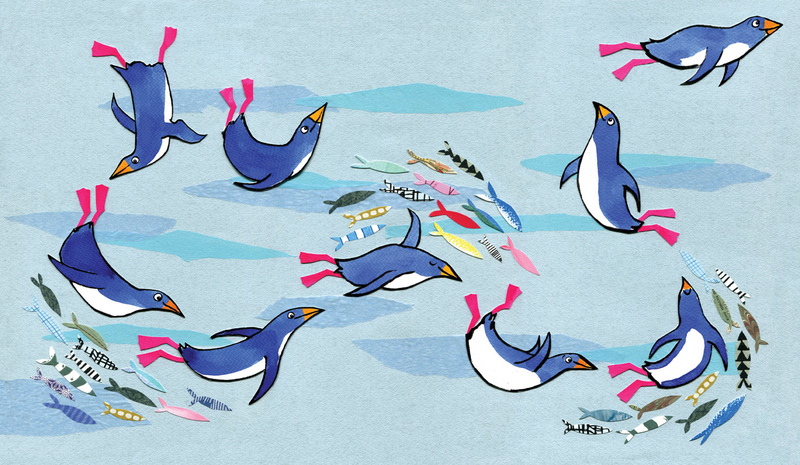 My favourite page to make was the one where Penguin finally ‘flies’ in the sea. I spent some time sketching the penguins in the glass-walled tank at Marwell Zoo to get a sense of the correct movement. I love sewing, so it seemed natural once the book was finished to make Penguin into a puppet. 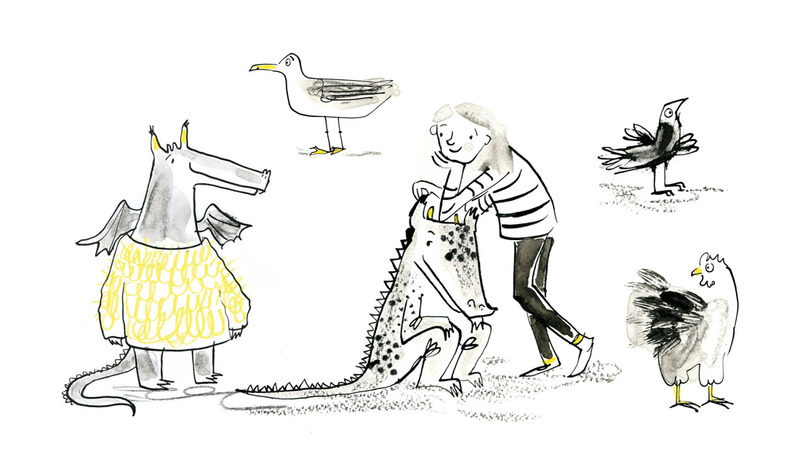 Paul, Penguin and I will be appearing at The Book Nook in Hove on Saturday 24th September – there will be a story reading and a craft activity. Do come! We hope to add more bookshop dates in the autumn. 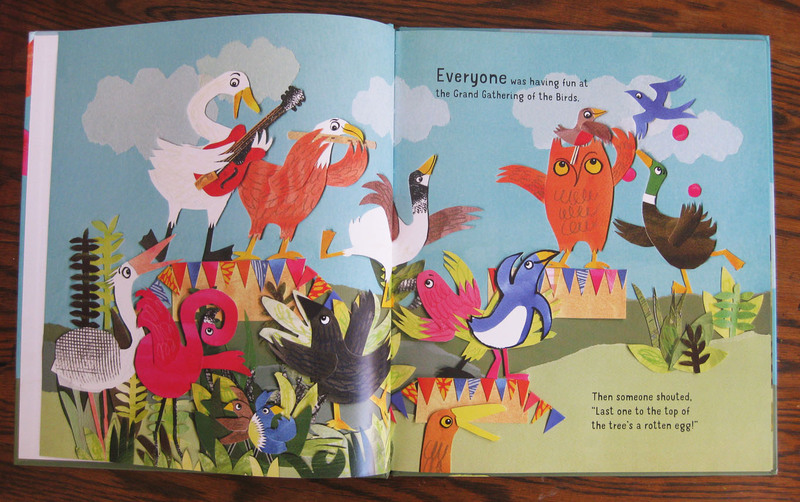 This entry was posted in birds, Books, General news, Illustration on August 23, 2016 by Jane Porter. 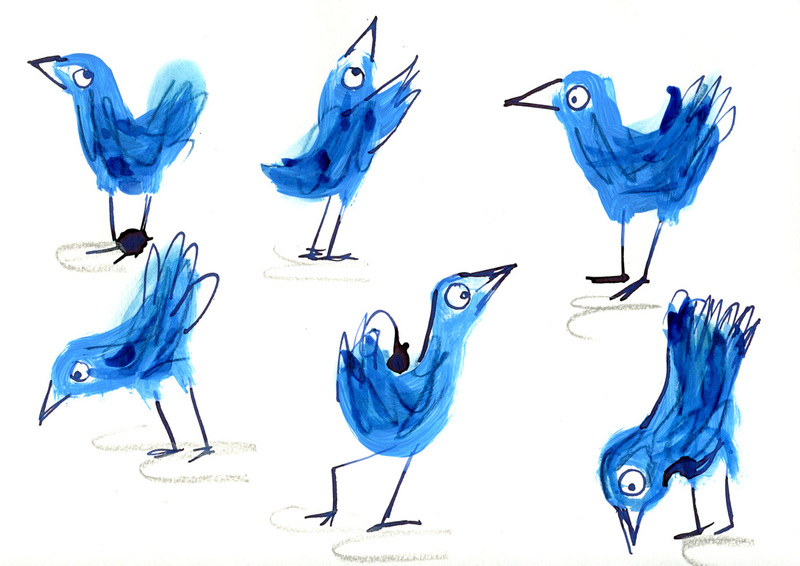 This entry was posted in birds, Illustration on April 21, 2016 by Jane Porter. 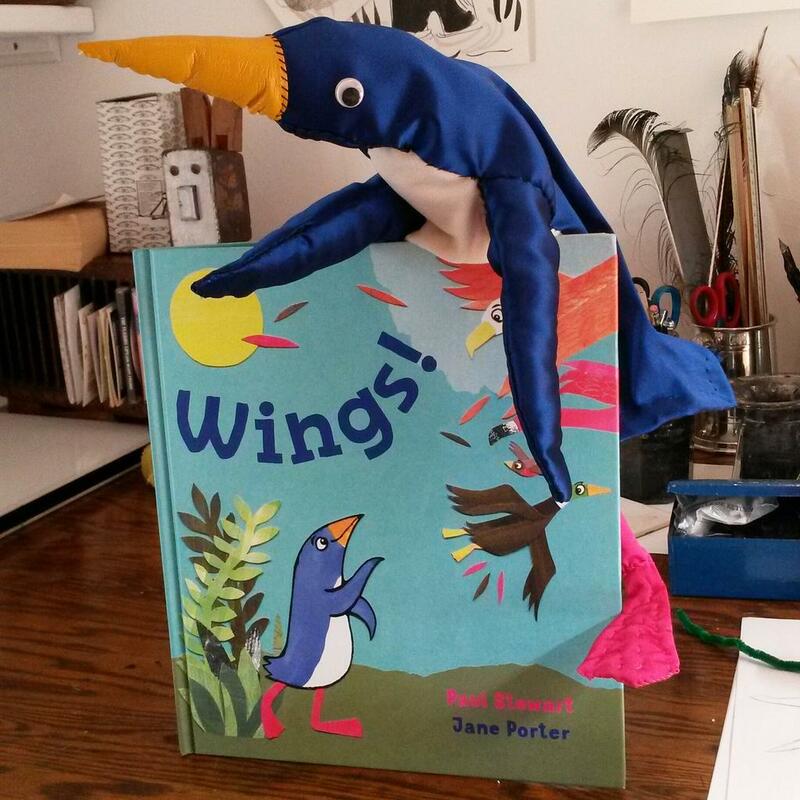 It’s only a few months now until the launch of Wings!, Paul Stewart’s lovely story about a penguin who wishes he could fly. 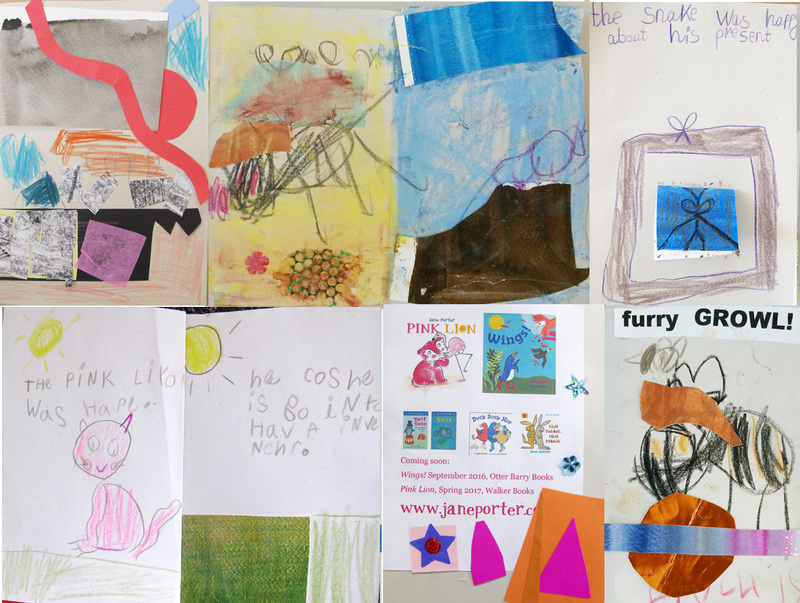 I illustrated the book, and decided to do it all in collage – very painstaking and slow! But I am pleased with the results. 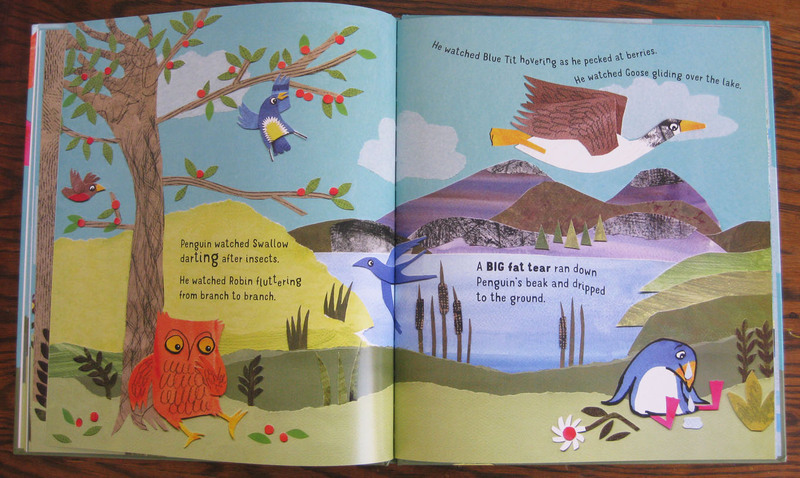 This is one of my favourite spreads, where Penguin finally gets an all-too-brief taste of flying – the landscape is based on The Gower, in south Wales, where I have spent many a happy camping holiday with my family. Wings! is published in September 2016 with Otter Barry Books. This entry was posted in Uncategorized on March 3, 2016 by Jane Porter. 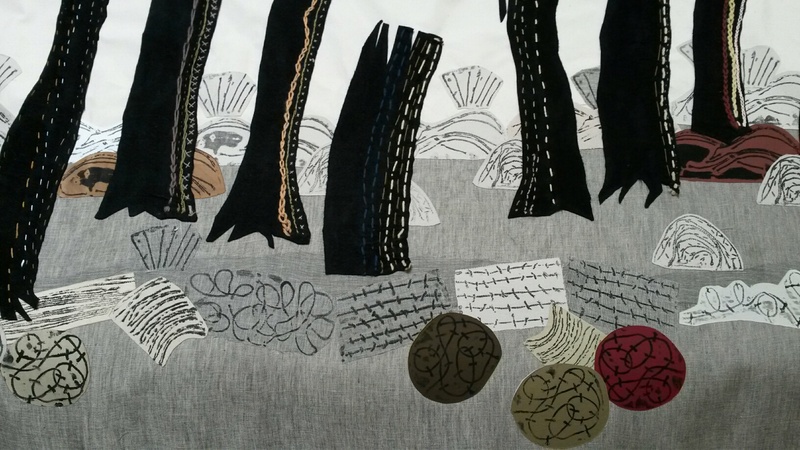 This entry was posted in Illustration, River projects on February 29, 2016 by Jane Porter.